Tron [TRX] and Justin Sun, CEO and Founder of the Tron Foundation, have both made it a point to integrate the concept of mainstream adoption with every update and development from the Tron roster. This move seems to have paid dividends for the tenth-ranked cryptocurrency, according to a recent post by Justin Sun. 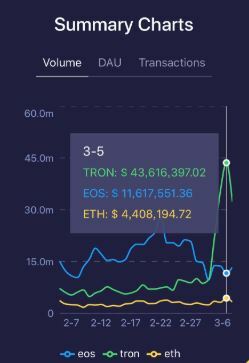 A report from DApp Review showed that between March 3 and March 5, Tron’s transaction volume was more than the combined value of its two biggest rivals, EOS and Ethereum [ETH]. The value of Tron was a whopping $43.616 million, while EOS and Ethereum clocked $11.617 million and $4.408 million respectively.